Much anticipated blockbuster, “Baahubali: The Conclusion” will get its South African premieres on April 27 2017 at 8.15 pm at two different locations first time ever for a Telugu cinema, Directed by SS Rajamouli and starring Telugu superstar Prabhas. As most of us know “Baahubali: The Beginning” was a 2015 global sensation that highlighted the wealth of ​Indian cinema. It has redefined the term "Blockbuster" and has won numerous accolades and millions of hearts across the globe. It is one of the very few Indian movies that has broken records worldwide, appealing to audience from every walk of life, in every country that it was released. 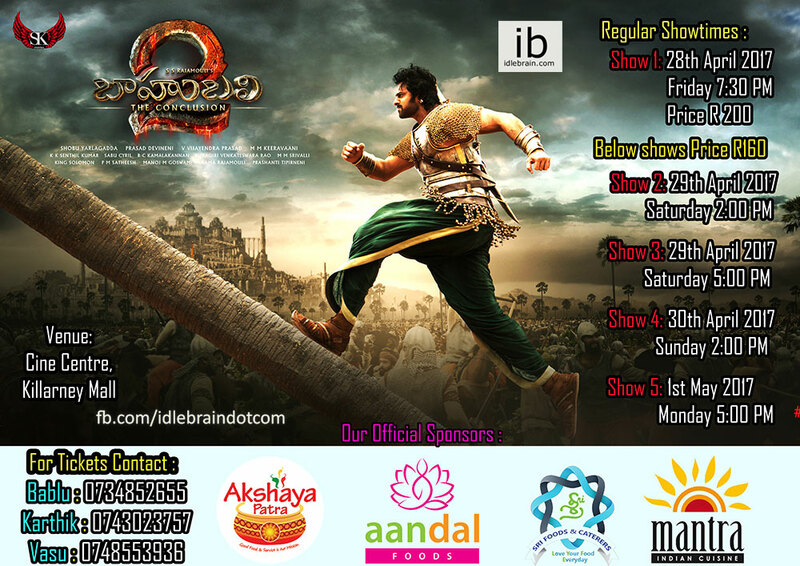 Bookings open for Premiers & Regular shows as well !!!! !